Apple Pie Ice Cream Made with Real Apple Pie! 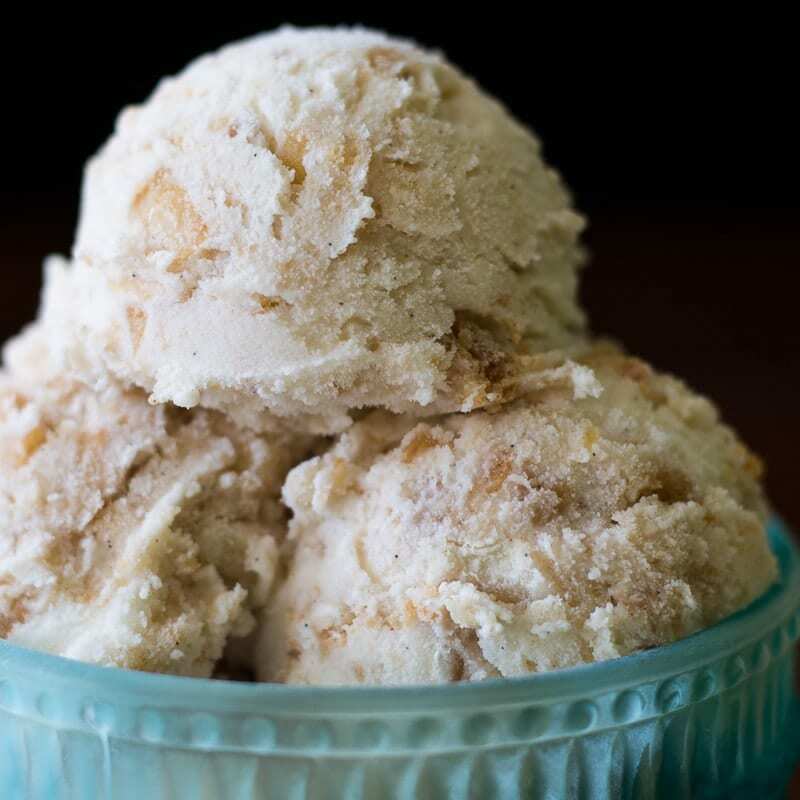 Apple pie ice cream is so much better when you make it with an actual apple pie! This simple recipe makes a perfectly delicious dessert. Try it! With all the celebrations that take place at this time of year, it seems especially appropriate to share the joy of pie with those you love. And what pie says love more than apple? 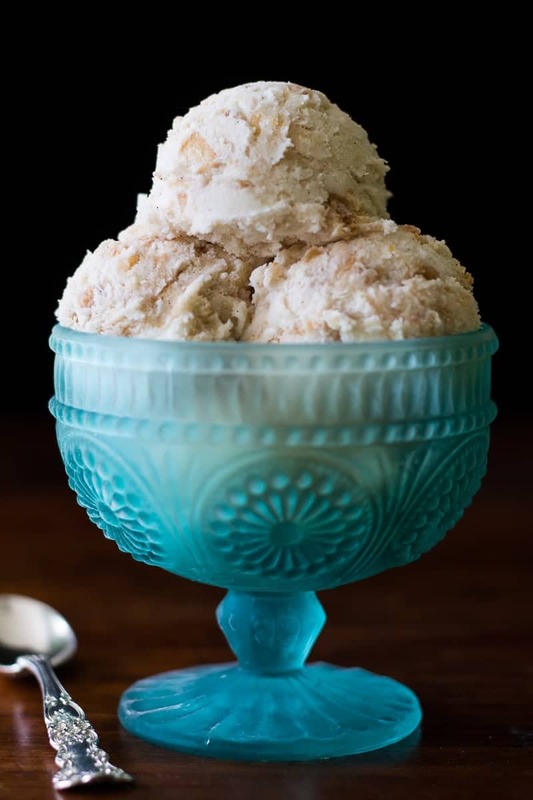 Ever since buying an ice cream maker last year, I’ve been wanting to make apple pie ice cream, and now I’m going to enjoy every bite! Some apple pie ice creams use ingredients like cookies and apple pieces to simulate the apple pie flavor. Not this recipe! To make this apple pie ice cream, I’m actually using a real apple pie. I picked up a Marie Callender’s® Dessert Pies Dutch Apple Pie at Walmart in the frozen food section, on the dessert aisle. 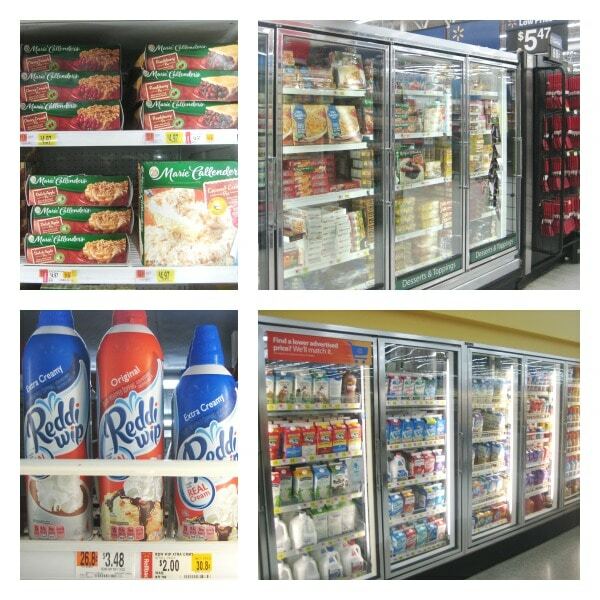 I also picked up some Reddi-Wip® to top it off in the dairy case. Plan ahead to make this apple pie ice cream, because you’ll need to allow time to completely chill the cooked pie in the refrigerator before incorporating it into the ice cream. (A warm or room temperature pie would melt the ice cream.) Once the pie is chilled, this apple pie ice cream can come together very quickly. 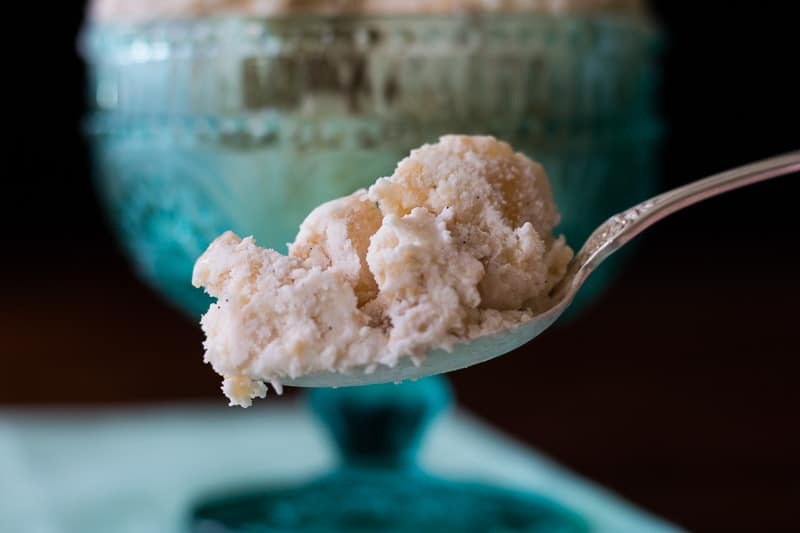 You can serve it soft right out of the churn, but if you want firm scoops, you’ll need to freeze it for a few hours or overnight. 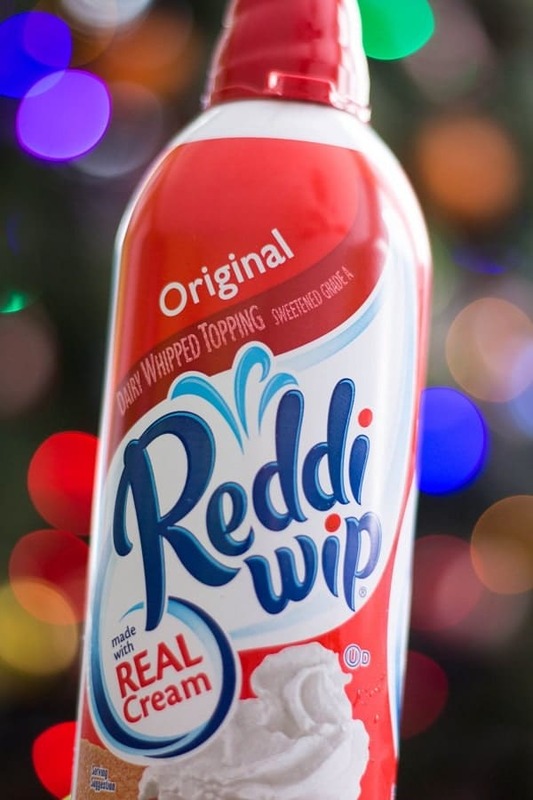 Once you’ve dished up your apple pie ice cream, give it a topping of Reddi-Wip just before serving. 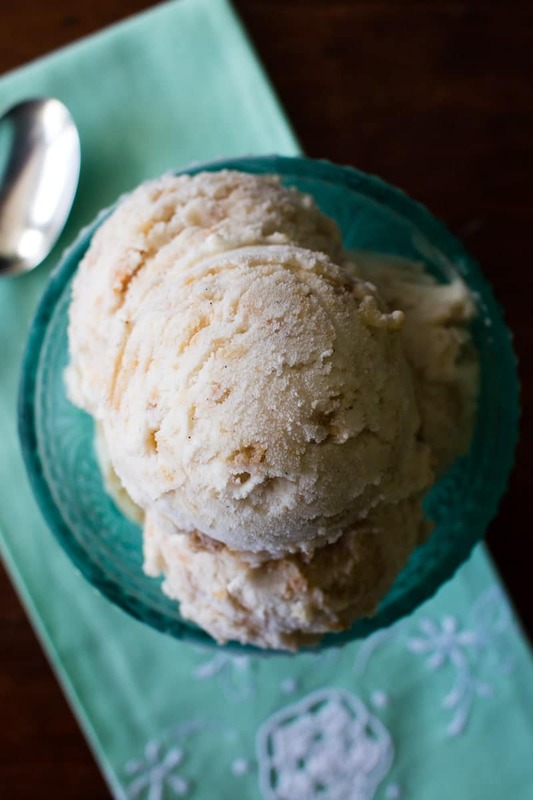 Apple pie ice cream is so much better when you make it with an actual apple pie! This simple recipe makes a perfectly delicious dessert. 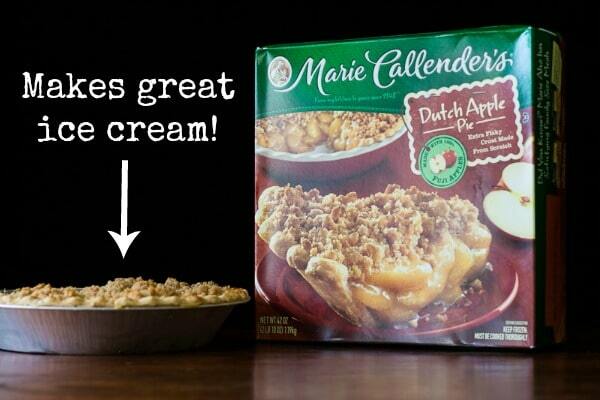 Chill a baked apple pie, such as Marie Callender's Dutch Apple Pie, in the refrigerator until cold. In a large bowl, whisk together the milk, sugar, and salt until the sugar is all dissolved. Add the heavy cream and vanilla bean and gently stir together (do not beat). Process the ice cream base in your ice cream maker. While it is churning, chop up the apple pie into small pieces to equal about 1 1/2 cups of apple pie pieces. When the ice cream is finished and still in the cold container, stir in the apple pie pieces a little at a time until fully incorporated. Serve while soft if desired or transfer to a freezer storage container to become firm. Share the joy of pie and check out these pie recipes! Previous Post: « Coffee Brownies Made with Real Coffee! That looks RIDICULOUSLY good! Pie and ice cream goes so well together that pie ice cream seems like a match in heaven. 🙂 My sister is the ice cream guru around our family, so I’m going to have to steal her ice cream maker and try this out ASAP! It is lots of fun. I’m looking forward to trying other mix-ins, too. Also, you’d be surprised by how inexpensive an ice cream maker can be- mine was refurbished and quite the steal. You made that? OMG, that looks absolutely incredible. I will have to give it a try! Goes perfect with that apple pie, that is for sure. Yum! Give it a go! I hope you like it! This looks so good!! I am always looking for new ice cream recipes to make at home! I never thought to use pie like this in ice cream, my husband would love this flavor! Ice cream is probably my favorite dessert so this sounds delicious! 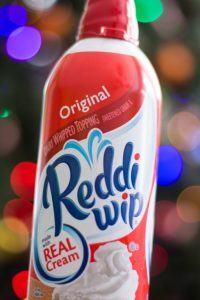 I love a dollop of Reddi-Wip to finish it off! I’ve never tried to make ice cream from pie, but I bet it’s just amazing! I may have to try it this weekend. I certainly never thought to do that but it’s quite simply a brilliant use of the pie. And to think I had one the regular one for Thanksgiving, lol. I’m so going to try this next time I pick up Marie Callender’s! I love apple pie and ice cream, so this sounds like the best combination! M daughter would probably dig this one too! I make a lot of homemade ice creams but never thought of this combination and now that I know about it, I have to make it right away. Thanks for sharing! Apple pie ice cream made with real apple pie?! Oh yes, I think I will! This is such a great holiday treat. I have been thinking about what I was going to make for the holidays and this might be a winner! Well doesn’t this sound delicious! It seems like Apple Pie everything is all the rage right now, but maybe it always has been and I’m just now noticing. Regardless, this looks amazing! It’s been a long while since we last made an apple pie. Making apple pie ice cream is a really unique idea. With this cool thought, I think we can make other ice cream flavors from other fruit pies as well.